Owl eyes are pretty amazing. They don't really have eye "balls" like humans and other animals. Instead, owl eyes tend to be more tube-shaped. Their elongated eyes are held in place by bones in the skull. Owl eyes are also relatively enormous when compared with human eyes. If a Great Horned Owl were the same size as a human, its eyes would be as large as a pair of oranges. In some owl species, the weight of the eyes accounts for up to five percent of the total weight of the bird. Because of the shape of an owl's eyes, the bird is unable to move the eyes inside their head. They have to turn their heads around in order to look around. An owl can turn its head about 270 degrees, or about 3/4 of the way around. There are some special adaptations in owl anatomy that allow them to turn their heads so far, including extra vertebrae in the neck, and different blood vessels that keep blood flowing between the head and body. 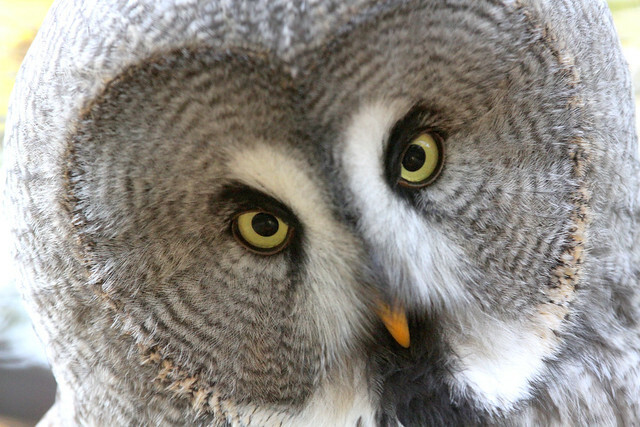 Unlike many other bird species, owls have forward-facing eyes. This makes them appear more human-like than other birds and may contribute to their general popularity among people. Compare the forward-facing eyes on the Great Grey Owl's face to that of the American Bittern below. Many owl species are nocturnal, but owls can see perfectly fine in the daylight as well as at night. Because of their excellent night vision, their pupils don't retract as much as in humans. Closing their eyelids halfway or more helps keep the bright light from hurting their eyes. This also gives owls the appearance of being sleepy in daylight, when in fact they may be fully awake and alert. Owls have three sets of eyelids. 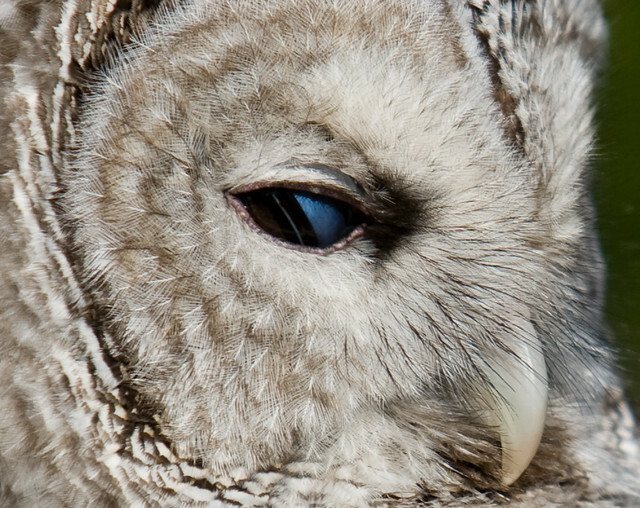 Upper and lower eyelids close when the owl blinks or sleeps. A third, semi-transparent lid, called a nictitating membrane, closes diagonally across the eye. This thin layer of tissue is used to keep the eyes clean and to protect the eye while still allowing for some vision. You can see this membrane partially closed in the photo of a Barred Owl below. Today we've added our 600th Birdorable bird: the Tawny Owl! The Tawny Owl is the most widespread species of owl across Europe. Tawny Owls are also found in western parts of Asia and northern Africa. Tawny Owls are recognized by their tawny brown striped body plumage, large round heads which lack ear-tufts, and oversized brown eyes. The Tawny Owl is primarily nocturnal, hunting prey items like small mammals and large insects. They prefer wooded habitat. They have adapted well to human development and will also inhabit parks and gardens. The Tawny Owl joins Birdorable today as our 600th species! With the Tawny Owl, we now have 127 species found in Europe and 12 total species of owl in the Birdorable family.